PNF Profiling Natural FluorometerOur natural fluorometers are integrated optical systems specifically designed to measure natural fluorescence — the fluorescence from the phytoplankton crop stimulated by available sunlight. Starting with research conducted at Biospherical under a NASA SBIR Contract and followed on with considerable additional studies has shown that this measurement is related to photosynthetic rates and chlorophyll concentrations. Unlike strobe fluorometers, a natural fluorometer measures fluorescence emitted under the ambient light conditions that are driving photosynthesis in situ. Measurement: Vertical profiles and logging of scalar irradiance (EoPAR) at depth and at the surface, upwelled (nadir) red radiance (LuChl), water temperature, and pressure/depth. Calculated values include photosynthetic rates, volume fluorescence, and chlorophyll concentration. Spectral Response: Scalar irradiance EoPAR with 400–700 nm spectral response. Upwelling radiance LuChl covering the chlorophyll emission spectrum, spectral response centered at 683 nm. 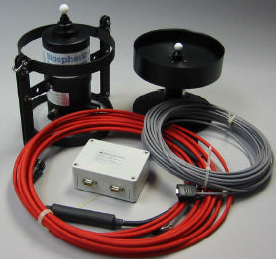 System includes: Radiometer with lowering frame, surface reference sensor, deckbox, 100 m underwater cable, 25 m surface reference cable, and data acquisition software. Kiefer, D.A., W.S. Chamberline, and C.R. Booth (1989). Natural fluorescence of chlorophyll a: Relationship to photosynthesis and chlorophyll concentration in the western South Pacific gyre. Limnol. Oceanogr., 34(5), 868–881. Chamberlin, W.S., C.R. Booth, D.A. Kiefer, J.H. Morrow, and R.C. Murphy (1990). Evidence for a simple relationship between natural fluorescence, photosynthesis, and chlorophyll in the sea. Deep-Sea Research, 37(6), 951–973. NF-65 Travel Case: Fits the system with up to 100 m of cable. Meets ATA requirements for checked baggage although system weight with cable may exceed allowable limits.